Welcome to the sixth highly exciting instalment of Who What Wear UK’s Best Wardrobes in Britain. It’s where we do exactly what that title says on the tin: delve into the most fantastical, awe-inspiring and downright influential wardrobes in this fair country of ours. We’re zeroing in on the girls who cause the street style photographers to press their shutters as much as the women you don’t yet know—the ones who fly under the radar with secretly incredible clothing collections. Was there a particular moment where you knew you wanted to get into fashion? I never thought I would. I absolutely loved clothes but never thought I would end up in a creative field as I started my career in banking. When I started in the fashion industry, I worked in digital marketing, and it was there when I realised I wanted to get into the more creative side of fashion. What would you say constitutes a normal day for you? 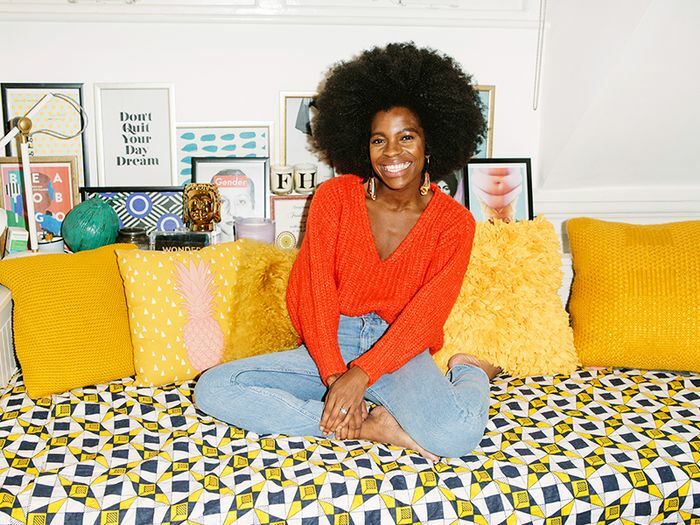 My job description ranges from brand collaborations to campaigns, doing talks and panels, hosting workshops, doing interviews… and I also run my brand of afro hair extensions, Big Hair No Care. I don’t have a normal day per se, but you can often find me in my kitchen working on my laptop with my assistant Sipho or in meetings. My husband is at home with my son, which means we also get to hang together, so I usually have lunch with them. In the evening, there often are fun press events and interesting panels, but I must admit I don’t attend them as much as I used to—I’m more bedbug than socialite. When it comes to your own style, how do you get dressed every morning? It really depends on my mood that day—I have to decide which Freddie gets her airtime! I look for an outfit that’s going to uplift the mood I am in, and I usually love to mix prints, stripes, bright colours. But on days I feel lazy, or simply cosy, I like a tomboy look and to be comfy, but with extra attitude to keep my mood upbeat. I like to think of my wardrobe as a lair full of costumes I can use to achieve my goals of the day. You're so good at finding great high-street pieces. What do you look out for? Haha! I do love a steal. I love basic pieces with a simple twist. At the moment, I’m obsessed with knitted jumpers with bell sleeves, they’re wonderful. Or sporty suits, and bodysuit blouses that tuck in your high-waisted jeans perfectly. It’s all about the little spins… and the prints, of course. What’s your favourite way to shop? I tend to shop spontaneously—sometimes when I’m in town in between meetings—by browsing online and on my favourite Instagram accounts. I never shop with friends. I need to get into my zone. Sorry to ask, but if your wardrobe was burning down, which one piece would you try to save? That’s quite panic-inducing! I’m not sure. I think I’d grab a pair of my favourite mom jeans. First because I could wear mom jeans every single day and never be bored, and second because then I won’t regret having picked a staple piece over another. I guess. What do you keep buying, no matter how many of them you may have already? Power suits. I’m obsessed with them. Do you ever step out of the house and regret what you’re wearing? Oh, yes! But I tell myself I only have to own it for a few hours—and not take photos of it. Knitted jumpers from the Sézane apartment in Paris. And what's on your list for spring 2018? Off-the-shoulder styles and more bell sleeves. What is your happy outfit—the formula that always makes you feel good? 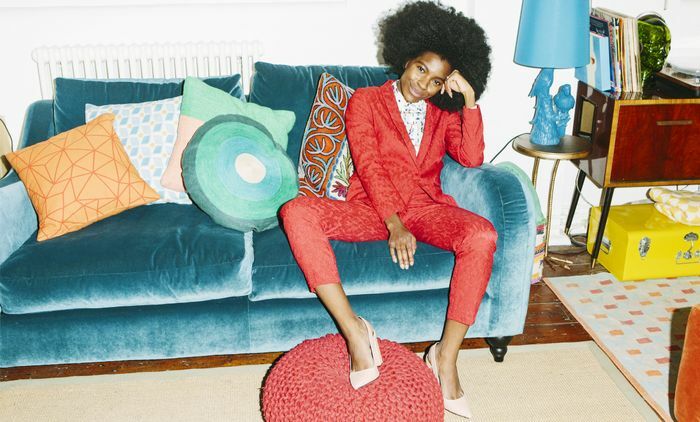 A bright printed power suit clashed with a pair of trainers for extra fun and a big brushed-out fro. Up next, the S/S 18 trends to know now.